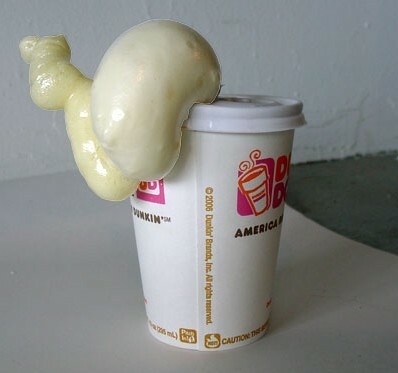 Nearly everyone has heard of expanding foam, or “expandy foam” as I call it. It’s the stuff that comes in a spray can at your local home improvement store. It has a long tube that screws on to the top, and when you squirt it out, it usually looks like a thick, solid yellowish foam that expands over time as it dries and hardens. Generally speaking, most people use it for insulating gaps, sealing around newly-installed windows, sealing cracks or gaps in old roof structures, etc. What you might not know is that it has another particularly handy use. A polyurethane, commonly abbreviated PU, is any polymer consisting of a chain of organic units joined by urethane (carbamate) links. Polyurethane polymers are formed by reacting a monomer containing at least two isocyanate functional groups with another monomer containing at least two alcohol groups in the presence of a catalyst. The benefits of expandy foam are that it provides a superior air barrier, waterproofing, sound insulation, and it also provides an added degree of structural support. Since it expands as it dries, it’s perfect for spraying inside wall cavities. In short, it’s handy stuff. Uses: Insulation, all types of sealing, filling of cavities, gluing of panels, tiles, corrugated iron, assembly, or weatherstripping of pre-hung door or window units. It’s the “gluing of panels” part that is most interesting. In fact, if you’ve ever used the stuff, you will have quickly realized that expandy foam is really, really sticky. It’s darn near impossible to get off your fingers – unless you have acetone. Acetone dissolves expandy foam on contact. If you don’t use the entire can of foam, immediately get your bottle of acetone, unscrew the spray tube from the can, and rinse out the spray tube and the top of the can with acetone. This will dissolve the foam so that you can use the rest of it later. Otherwise, the foam in the tip of the can and inside the spray tube will harden, and your half-full can of expandy foam will be utterly useless. So, before you do anything with expandy foam, make sure you have a big bottle of acetone on hand. So, as I was saying, expandy foam is ungodly sticky. The can also says it’s good for gluing tiles and such. Well, one day I just happened to be installing a window in a stone house. I needed some way to secure a wood sub-frame to the stone, and then the window itself would attach to the sub-frame. I had some serious anchors and long, fat screws to secure the pieces of wood that would form the sub-frame, but it wasn’t a square frame. It was just two pieces of wood, one on the right side of the window, and one on the left. I needed some extra rigidity somehow, and a cross beam would have been impractical. It was at this point that a little lightbulb in my head went off. I used my trusty 1100W hammer drill, Goliath, to drill 3 holes in the stone for each board. I then drilled pilot holes in the board for the 3 long screws. Before attaching the board to the stone, I sprayed a generous line of expandy foam onto it. Then I positioned the board, screwed the 3 fat screws through the board and into the anchors in the stone wall, and let it dry. Before the expandy foam had dried, the board moved a fair amount. It was firmly attached, but not rock solid. So, I waited. When I returned, the expandy foam had gooshed out the tiny gap between the board and the stone wall. It had tried to expand, but couldn’t because the board was screwed tightly to the wall. After I cut away the excess hardened foam, I tried to budge the board. I couldn’t. I grabbed the thing and pulled and pushed and yanked as hard as I could, but it seemed that the board had literally become superglued to the stone wall by the “compressed” expandy foam! I then repeated the procedure for the other side of the window opening, installed the window, and all was well. Oh, and of course, when the gap between the top of the window and the window opening presented me with an empty cavity that needed to be filled, I sprayed some more expandy foam inside and boarded it up! The moral of the story is that expandy foam is excellent as a glue – especially for securing wood to brick or stone. I also used the stuff to glue 2 short pieces of wood to a concrete fence post in order to hang a gate. I couldn’t drill holes into the post because of the iron rebar inside, and I needed some quick and easy way to secure the gate hinges to the fence post. After spraying the expandy foam on the pieces of wood and sticking them on the post, I put 2 metal bands around the wood and the post just to hold them tightly until the foam had dried. Well, it dried alright, and despite beating the hell out of the gate, it is still firmly attached to the concrete post! So, the next time you need a powerful strong bond, I reckon you should try expandy foam! Top tip, off to try it on some skirting boards where the plaster doesn’t reach the floor. ive been thinking of welding closed a back sliding door of my van. you think i could use this to seal the door? I had a similar “think outside the square moment” when my very old western red cedar patio table collapsed after all the joints and fittings became rotten. I nearly threw it out but it was a useful work stand for all sorts of gardening chores so I wanted to salvage it if possible. The lightbulb went off, and I grabbed a can of foam and sprayed it around all the joints and across the underside of the panels for good measure. Thick runs of foam bulged up and around the joints. After it set, the damn thing was rock solid! The foam stuck to the old wood no problem. A marvellous result. Is it safe to use on aluminum? I have before and never noticed any negative effects. great, I work at a aluminum plating shop and looking for a product like this to mask parts. I would like to do some more research to find out how it would hold up in our anodizing tanks. Thank you for getting back to me. I have a caned rocking chair where the canes in the seat are breaking at the inner wood frame. The caning wraps completely around the wood frame, making an inner cavity. I’m thinking about injecting foam in between the top and bottom level of caning to make a solid seat and stop the breakdown of the caning. What do you think?